You might have a favorite cookie or brownie recipe – but did you know you could make it even better by adding a simple, familiar ingredient? With a few expert tips from Buddy Valastro, author and star of TLC’s “Cake Boss,” you can take your sweet treats from good to great in no time. Start with Quality Ingredients – When you start with better ingredients, you end up with a better cookie or brownie. Use real butter, high-quality vanilla and great tasting chocolate. 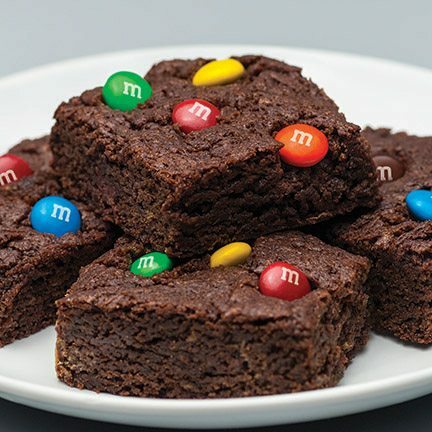 Here, Buddy shares some of his favorite recipes that use M&M’S candies to add an extra special touch to family favorites – making them even better. Chill the Dough – Leaving cookie dough in the refrigerator gives it more body and results in a fuller and better tasting cookie. Plan ahead so you can refrigerate your dough at least one hour – or, even better, overnight. Keep It Uniform – Use a small ice cream scoop to keep your cookies the same size. This not only helps them look professional, but bake up evenly and consistently. Pans Matter – Bake cookies on light-colored, non-insulated cookie sheets without sides. Metal pans will cook brownies faster than glass pans, which means cooking times will vary. Start checking your brownies early to test if they’re ready and prevent over baking. You can find more sweet baking tips and recipes at www.facebook.com/mms. Bake Amazing M&M’S Cookies with butter, brown sugar, vanilla extract and M&M’S Milk Chocolate Candies. In large bowl, cream butter and both sugars until well blended. Add egg and vanilla extract, and mix to combine. In separate bowl, sift flour, baking soda and salt together. Slowly add dry ingredients into butter mixture and stir until combined. Fold in candies and chill dough for 1 hour or overnight. Drop dough by rounded tablespoons onto lightly greased tray, about 2 inches apart. Bake for 8 to 10 minutes for chewy cookies, or 12 to 14 minutes for crispy cookies. Combine chopped candy bars with ricotta, sugar and orange zest. Spoon mixture into resealable bag and snip off a 1/2-inch corner. Fill cannoli shells by squeezing in filling from each end. Decorate both ends with chocolate candies. In large bowl, cream butter and both sugars until well blended. Add eggs and vanilla extract, and mix to combine. In separate bowl, sift flour, cocoa powder, baking soda and salt. Slowly add dry ingredients to butter mixture, and stir until combined. Fold in candies and walnuts, if desired. Chill dough 1 hour, or overnight. Bake for 7 to 9 minutes for chewy cookies, or 10 to 12 minutes for crispy cookies. In 3-quart saucepan, gently combine the semisweet chocolate and oil over very low heat until melted. Remove from heat and allow to cool. In separate bowl, combine sugar, eggs and vanilla extract until blended. Add in chocolate mixture. Slowly sift in remaining dry ingredients and mix until combined. Fold in 1 1/2 cups candies. Spread batter into pan. Sprinkle with remaining 1/2 cup candies and press lightly. Bake until brownies begin to pull away from sides of pan, about 30 to 40 minutes.